.a wealth of knowledge and as down to earth as they come. In addition to his reputation as a blogger, he also runs his own PR and Marketing consultancy, Wark Communications. While I haven't worked with him personally, my hunch is that he's darn good at what he does. However before I go into Tom's thoughts, first I must explain why I've been MIA. My life has been about as topsy turvy as it gets these last few weeks. After a successful yet humbling week in New York, (more on that later) I came home to the unfortunate news that Leone, my personal assistant and marketing manager of 10 years, was leaving the winery. This came as a complete surprise. Needless to say, it felt a bit like having my right arm ripped off after all, she has been an extremely valuable and trusted member of my team and someone whom I consider a close personal friend. It's certainly a great loss for me personally and the winery as well, but I do wish her all the best in her new career endeavors. After the initial shock wore off, I immediately went to work on recruiting her replacement. Thank goodness for winejobs.com! Within 24 hours, I already had some strong candidates. While it's awful to be in this position, it's a great time to be hiringit's just a matter of finding the right fit. So I'm spending every spare moment meeting with candidates, asking thought provoking questions (can you mail merge, coordinate projects, handle details, provide a shoulder to lean on, and oh by the way, pick up my kid in an emergency?!) while trying to find my clone for the next ten years. 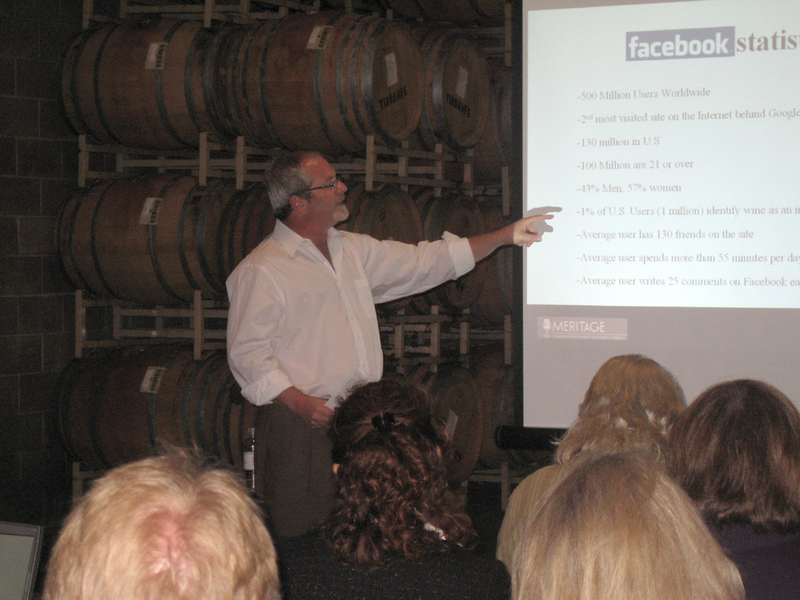 Back to the Meritage Alliance meeting - we had a hodge podge of attendees from vintners, journalists, and PR people, although I was disappointed that more didn't take advantage of this FREE opportunity to learn from one of the best in the business. The defining essence that ties the two together is that both are vehicles for telling your brand story. And, just like with all marketing communications, it is critical to be consistent and on message, saying the same thing over and over and over and over again. Then, when you think you've said it enough, you start over again! The difference between the two is that traditional media is like the 3 tier system- content goes from the company/product, to the publication/writer, to the consumer. With social media the content goes directly to the consumer. As marketers of just about anything - wine, clothing, computers, whatever, we need to embrace both. Tom focused heavily on Facebook and actually took us through a step by step look at how it works. He is convinced it's effective-that it actually can help sell a product and grow a brand, despite what many skeptics (myself included) believe. He stressed the importance of making Facebook a priority-if you're gonna do it, do it well and do it often. Post info on wines. Post info on events. Post info on wine related topics. Post questions that customers might be interested in. Post photos of customers. Post while you're on vacation. Post photos of your vacation. Post, Post, Post! how the heck is anyone supposed to have time for all this??? Sure, I'd like to have a more intimate relationship with my customers. But truth be told, I'd like to start with my husband and kids whom I've missed sorely lately. Thanks for the encouragement Kristi, you're absolutely right. As a matter of fact, I'm at the winery reviewing resumes while waiting for my next interview to show up. While it's a burden in the short run, I know it will indeed be a breath of fresh air...it's just one of those things that throws you for a loop and requires a great deal of time and effort. You have to be the hardest working woman I know! In between, replacing new personnel, traveling to conduct sales presentations, pouring at events, attending trade seminars, doing budgeting, dealing with the licensing agencies, meeting compliance laws, etc..., I'm wondering if you any have time left to be a wife, mom & daughter? Great article on using Facebook to promote your business. I'm on Facebook everyday, & it has certainly enhanced my life in terms of reconnecting with classmates, relatives, friends, & creating new friends. I'm sure FB will also help your wine sales. This page contains a single entry by Kim published on May 27, 2010 1:40 PM. Food with Eyes! was the previous entry in this blog. 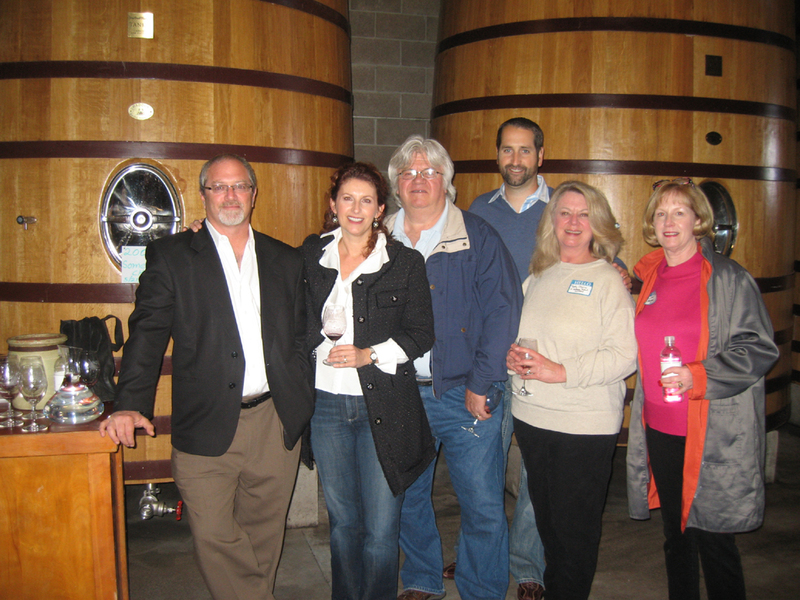 The University of Dry Creek is the next entry in this blog.